LATEST OFFERS Latest Full Talk Time Offers Latest 3G Data Offers Download Latest BSNL Tariff Cards BSNL : Frequently Asked Questions / Doubts ??? 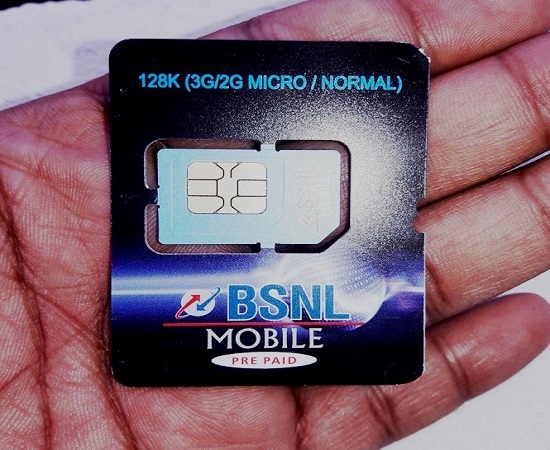 PAN India 3G service provider, Bharat Sanchar Nigam Limited (BSNL) slashed MRP of SIM cards for its prepaid and postpaid mobile customers in all the circles. Now customers may get new BSNL SIM cards @ just Rs 10/- only. Revised charge of Rs 10/- is applicable to 32 K to 128 K - Normal SIM / Micro SIM / Nano SIM/ Repluggable SIM (Normal+Micro) / Repluggable SIM which contains Nano SIM. In addition, BSNL has also slashed MRP of 256K SIM (Normal/Micro/Nano SIM/Repluggable) to Rs 50/- from existing rate of Rs 100/-. *in case of Jammu & Kashmir, above SIM Price is exclusive of GST. All other tariff / terms and conditions would remain same. The above tariff will be implemented with effect from 05-07-2017 on PAN India basis. The above SIM charges are applicable to New Customers also as the initial charges include the Plan Voucher Charges + SIM Card Charges in case of Prepaid Customers. Existing BSNL Mobile customers may replace their old SIM cards with higher capacity SIM cards by submitting the ID proof in the nearest BSNL Customer Service Centre (BSNL CSC). Dear readers, please share your views and opinions about the latest rationalization of SIM Prices / Replacement Charges by BSNL via comments with us. How to Extend Validity of BSNL Mithram Prepaid Mobile Plan, Top Up 200 or Recharge 49 ? BSNL's New Mithram Prepaid Mobile Plan & Validity Extension Methods || How to extend the Validity of Old Mithram Plan? How to Activate ISD Facility in Your BSNL (Prepaid / Postpaid) Mobile? All content provided on this website is for informational purposes only. © KeralaTelecom 2014. Theme images by MichaelJay. Powered by Blogger.